McCaskill has been head chef at the Simon Kardachi-owned restaurant – currently called The Pot by Emma McCaskill – for the past 18 months, having previously worked at the award-winning Magill Estate. Since she’s been at The Pot, it has secured a Good Food Guide hat and made it onto The Australian Financial Review’s Top 100 Restaurants list (in 87th spot). 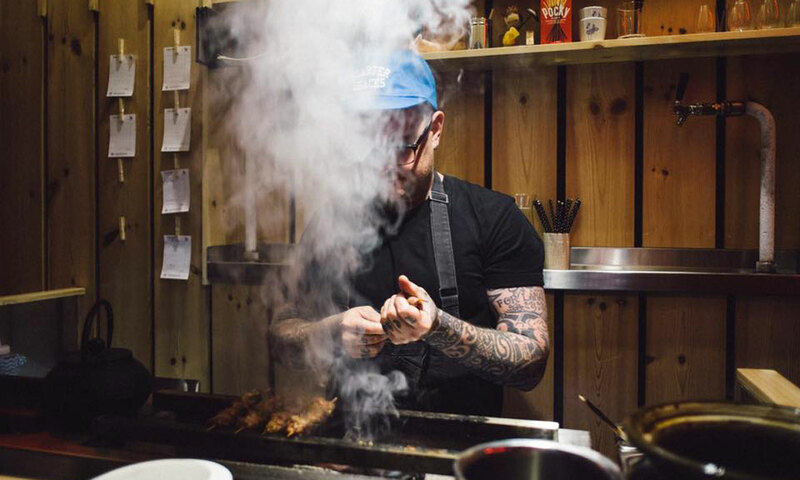 Chefs Adam Liston and Max Sharrad of Shōbōsho – another Kardachi restaurant, which also made the Top 100 Restaurants list this year – will act as executive chef and head chef, respectively, across both The Pot and Shōbōsho from October 16. Liston tells InDaily the pair will divide their time between the two restaurants, and says he is excited “to spread my wings a bit” and exercise his creativity in the kitchen. “One of the challenges with Shōbōsho is that because it’s a Japanese/Asian style of restaurant, there’s a restriction on what can go on the menu, but the Pot was really designed around being a melting pot of different cuisines from around the world. Adam Liston on the Shō grill at Shōbōsho. Diners are being assured that “it is not a matter of Shōbōsho moving to the suburbs”, and that The Pot will continue to serve “wine-bar friendly dishes” driven by the wood oven and seasonal ingredients. Liston and Sharrad are, however, working on a new menu which will reflect their own experience, food influences and tastes. Liston says it will include “snacks” such as a pizzetta with anchovy and culatello (salumi) and pasta dishes with a Japanese twist (such as infusions of kombu or seaweed). There will also be a strong focus on weekend brunches, with dishes such as mortadella charcoal panini with green olive tapenade and stracciatella cheese – “like a really glamorous ham and cheese toastie”. “I wouldn’t call it a fusion restaurant … it’s just the things we want to eat,” Liston says. The Pot is described as the “keystone venue” in Simon Kardachi’s portfolio of 11 restaurants and opened in 1999 as The Melting Pot. It is familiar territory for Liston, who has worked there previously as a sous chef and then head chef. Kardachi welcomed his return to the restaurant, which he says is “a melting pot of creativity for outstanding talent”. McCaskill said in a statement that her time at The Pot had been “incredibly rich and rewarding”.